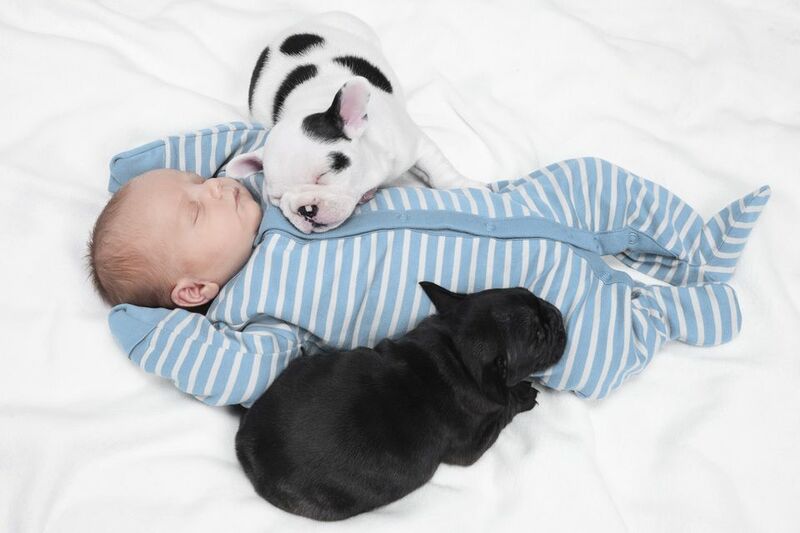 Introduce your dogs and babies properly and they'll be on their way to becoming great friends. A dog's interaction with babies can have positive benefits besides furry love. Studies show that infants who grow up with pets have a much lower chance of developing allergies to dogs as they grow up. However, clueless pups—and active infants—also have the potential to hurt or even terrorize one another. When you're expecting a new baby (or a visiting infant or new grandchild), prepare your puppy in advance to make sure interactions stay safe. Most pups are curious about infants because they have so many interesting smells—milk, baby food, poop...what’s not to love? Confident adult dogs often are very tolerant of babies because they recognize that they’re not grown up. However, clueless puppies have no experience with infants or toddlers, which can prove scary if they chase your pet, pull his tail and make strange high-pitched noises. Babies that crawl may mimic prey behavior in their sounds and actions. Wary pooches may switch into play-aggression mode or become defensive and try to drive away the scary creature with growls and scary teeth. Neither option is good. Children also are on the puppy’s level where all of his most prized possessions are at risk. Your new baby won’t know any better than to play with dog toys, climb into the puppy bed or explore the food bowl. It’s a natural behavior for dogs to protect their things and react with aggression when your infant doesn’t understand the pup’s clearly communicated growls or other body language warnings. Let Puppies Explore. Allow your pets to investigate the redecorated nursery. This is especially true if the pup previously had free access to the room because banning your puppy may cause behavior issues when they’re left out. Think about puppy-proofing the room so baby toys, as well as the diaper pail, are out of dog-munching range. Manage Access. Install a baby gate in the doorway so your pet can see into the room and be a part of the joy but is kept out when you can’t supervise his actions. Practice Crying. Fussy babies sound similar to prey, so it can be upsetting for some dogs to hear this. Record infant cries and play them back to your pup to acclimate him to the sounds. Your puppy may ignore the sound or act curious; reward either behavior with calm praise. Offer Positive Associations. Give the puppy special treats when he acts in a calm way near the baby’s areas. Dab on Baby Smells. Begin wearing baby powder or lotion weeks in advance so your pup associates the scent with a beloved and safe human he already knows. Adjust Your Schedule. A new baby throws routine out the window. Prepare your pup so he’s already adjusted to the new timeline, and be sure to include special time with so he won’t feel neglected. While you’re understandably happy, excited and exhausted with a new baby in the house, excluding pets from your joy only confuses them at best. Give an Advance Sniff. When the baby finally arrives, bring home something scented with the infant, like a baby blanket or onesie, so that your pup has an advance introduction. Spritz the Baby Socks. For nervous pups that might act fearful, use a bit of the Comfort Zone with DAP and spritz it on baby socks. That way the footwear contains the canine “no fear” pheromones that helps keep puppies calm. Have the baby wear the socks, and voila! Your baby now smells like something safe so your dog more readily recognizes the infant as a safe and acceptable member of the household. When you bring home the baby, treat the event in a matter-of-fact manner, and don't make a big deal of the introduction (even though it's momentous!). You want your puppy to understand this is a normal, expected part of his life. Act Normal. Don't force the introduction, but if he acts interested, allow the pup to sniff the baby's foot, perhaps with that scented sock. If you have more than one dog and they get too excited, allow one dog at a time access to the toe-sniff so you aren’t overwhelmed. By allowing a puppy to actually look at, smell and touch that creature that's so very different, he'll understand there's nothing to fear. Give Ownership. Try referring to the child as belonging to your dog, like “Spot’s baby.” Yes, it sounds silly, but just saying the words changes your attitude which can be comforting and calming to your pets. Reward Calm Confidence. Praise pups when they behave well and ignore shy or fearful behavior. Associate Good Things. Puppies quickly learn to associate the baby with what’s important to them. If you ignore or yell at the puppy when the infant is near, the baby will acquire negative associations. Figure out what your pup loves and link it to the baby’s presence. Maybe you can toss treats or play with a favorite toy when the baby naps on your lap, for instance. These tips will help you create a safe and happy environment for both your puppy and the new baby to grow up together as friends, perhaps even best buddies. Of course, don't leave even friendly dogs alone unsupervised with your baby as accidents can happen in the blink of an eye. If you have visiting youngsters who are older, follow these tips for introducing puppies to toddlers and older children. How to Establish a New "Puppy Routine"